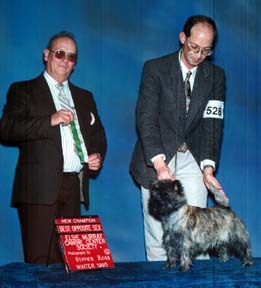 Robin was our first Cairn Terrier. Now retired, she is the dam of 3 champions thus far and one who will be shown in 2002. Her First litter produced Ch. Cairnbrook's Forever Amber and Ch. Cairnbrook's Remember Me Sasha, sired by BISS Ch. Checker's Beauregarde. Her next litter sired by, BISS Am.Can.Ch. McCairn's Sir Henry Hudson, produced our BISS Ch. Cairnbrook's King's Ransom "aka Spencer." We look forward to introducing Cairnbrook Covergirl "Hannah" to the show ring in 2002.